MetroKitchen will price match the TOTAL current price of any in-stock item from an authorized retail site. Black Friday and Cyber Monday special deals are EXCLUDED. Price match applies to the TOTAL price, including shipping/handling, gift with purchase and sales taxes. Price match does not apply to auction sites, sites selling "seconds," or those not authorized by the manufacturer. We must be able to verify the price. Not applicable to previous purchases. 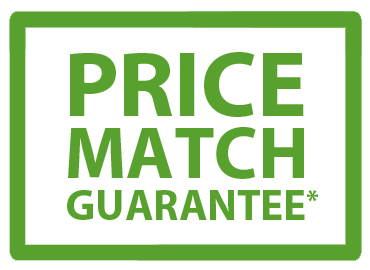 To request a price match, call us at 866-276-4550 and we'll be glad to help you! FREE GIFTS WITH YOUR PURCHASE! Buy $500 or more of All-Clad & receive a FREE Stainless Steel Oval Roaster, 2 All-Clad Pot Holders. $170 retail value! Ships with order! *Order has to be $500 or greater to qualify for gifts. Smaller, separate orders cannot be combined. The All-Clad Tri Ply non-stick stainless steel 8 & 10 inch fry pan set is a great value and a must have set for any kitchen. 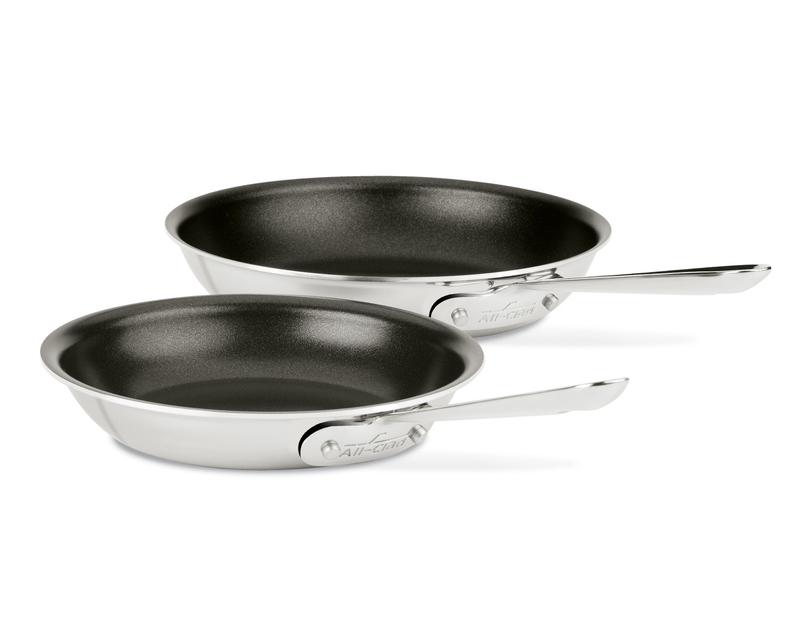 These American-made non-stick skillets are compatible with induction cook tops. They're also dishwasher safe. The flat bottom and sloped sides of these stainless frying pans from All-Clad allow for foods to be quickly moved around over high heat. As with every All-Clad cookware set, these non-stick pans come with the All-Clad lifetime warranty against manufacturer defects, with normal use and proper care. You'll appreciate the heat control and consistency from All-Clad's fully clad, multi-layer construction. Clad cookware from All-Clad has a pure aluminum inner core sandwiched between 2 layers of stainless steel. This combination ensures fast and even heating. Heat is even and quick as result of a layer of heat-conducting aluminum bonded with two layers of stainless steel. All-Clad fully-clad cookware is made in the USA. Please note: Minor imperfections and slight color variations are normal in All-Clad cookware and All-Clad cookware sets. For the best cooking performance, we recommend heating the pan for 1-2 minutes prior to adding food. Use a low to medium heat setting. Suitable for all cooking surfaces--induction, gas, electric, halogen, ceramic. Add salt after water has started to boil, otherwise small white dots or pits can form. Pitting does not interfere with cooking, it just doesn't look good and can be easily avoided. To remove food residue and stains on the exterior of non stick cookware, use a nylon scrubbing pad and a fine-powdered cleanser. Overheating can cause blue or brown discoloration. Remove with Cookware Cleaner or other fine-powdered cleansers. We recommend allowing cookware to cool prior to washing, otherwise warping may occur.